Brand Flights is the Agency of Record for Algar Ferrari. We completely rebranded the dealership after an ownership change. Our team engaged with every department within the dealership to understand their business objectives both internally and for their customers. 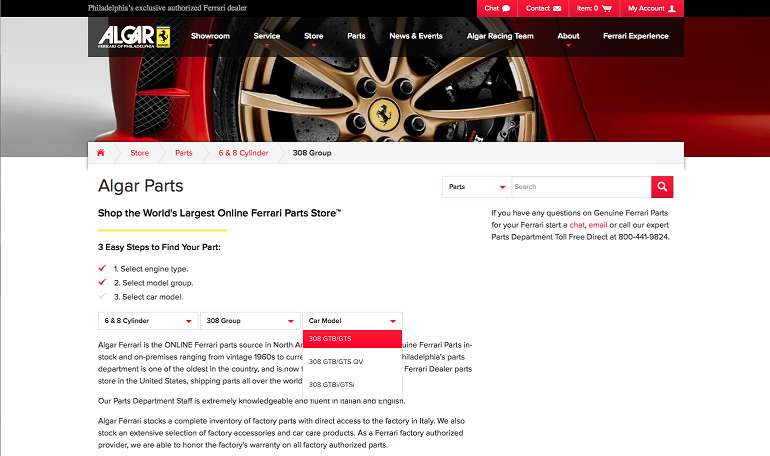 We then built a responsive designed state-of-the-art website including The World’s Largest Online Ferrari Parts Store™ complete 53 online parts manuals, thousands of parts diagrams and 75,000 individual parts for sale online using the Magento Ecommerce platform. We provided complete architecture, design, UX, content, built on an editable CMS, integrates with ADP software, Homenet Inventory System, iFramed Ferrari Vehicle Custom Configurators to customize colors, interiors, wheels on a new Ferrari. The site has been named the best dealership site in North America by Ferrari.